Home » Shows & Events » Who’s Calling? 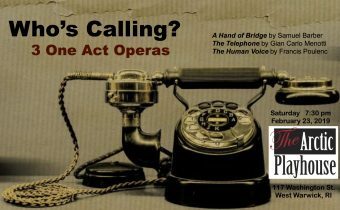 Three One-Act Operas is an ambitious performance of three short contemporary operas in English including comedies “A Hand of Bridge” by Samuel Barber for card-playing vocal quartet and “The Telephone” by Gian Carlo Menotti, about a woman on the phone and oblivious to her boyfriend’s advances. The third is “The Human Voice” by Francis Poulenc, a forty-minute dark drama on the telephone for soprano soloist. Rachel Hanauer and Chelsea Swan are stage directors (and performers), Jean Maxon on piano. This hour-long performance will certainly make you reminisce about the 1950s! « A 2019 Christmas Carol!